This week we look at ice baths and fermentation chilers for brewing lager beer. Brewing a lager can be a frustrating experience for many home brewers who lack a separate fermentation refrigerator. However these methods, including the “Son of a Fermentation Chiller”, give you the ability to brew a lager at home without a separate fridge. 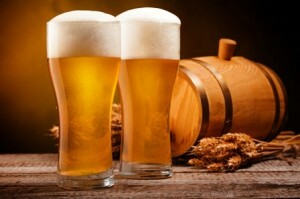 Ales are easy to ferment at home – as most can be fermented near room temperature of 68-72 F (20-22 C). Lagers present a special challenge, however, as most lager yeasts require a fermentation temperature between 45-55 F (7-13 C). This temperature is slightly above the temperature of a typical home refrigerator, and well below the temperature of most homes. Unfortunately if you ferment your lager too warm, you will get excessive ester production along with other off flavors that will cause problems in the finished beer. Temperature is most critical during active fermentation, but ideally you would like to keep your lager cold throughout the entire fermentation and aging period. The simple solution is to purchase a separate refrigerator or freezer along with a temperature controller that switches the fridge on/off to maintain the desired fermentation temperature. However not all brewers have the money or space for a dedicated beer fermenting refrigerator – particularly one large enough to hold a typical 5 gallon (19 l) carboy. So we’re going to look at some makeshift alternatives for fermenting your lager. One solution is to use an ice bath to chill your fermenter and maintain its temperature. This can work surprisingly well but it does take some care and feeding to make sure you maintain enough ice in the bath throughout the fermentation. It also helps if you can keep the entire ice bath insulated so the ice melts slowly and the entire system stays within a few degrees of your target temperature. A Large Picnic Cooler or “Gott style” water cooler can contain/insulate your fermenter. Ideally you would like the fermenter immersed in the ice bath and contained entirely in the cooler, but even a smaller cooler can work if you put insulating material over the top to maintain the temperature. A Large Bucket with Insulation – You can use a large tub with the cold water in it and then either surround the entire bucket and fermenter with high quality insulation wrap or build an insulating box out of insulating styrofoam (1-1/2″ or 2″ styrofoam board). When using this type of system, you will need to use quite a bit of ice to get the fermenter to its initial fermentation temperature, then pitch your yeast. After that you will typically need to add more ice at least twice a day, possibly more depending on your insulation and ambient temperature. One trick is to use plastic bottles of ice. Fill a number of old 1 or 2 liter bottles with water and freeze them in your refrigerator. Change them out at least twice a day, and use a thermometer to monitor the temperature of your ice bath. Using bottles also means you don’t have to deal with the “ice melt” – or increasing volume in the tub as the ice melts. Some brewers have even made sophisticated water chillers that have separate ice bath as well as a pump and controller to maintain a constant water bath temperature around the fermenter. Personally, I prefer an air cooled system (see below) to provide precise temperature control as it is generally cheaper and simpler to build. Another solution is to create your own air-cooled box. One example of this is Ken Schwartz’ popular Son of a Fermentation Chiller design. The chiller is basically a three chamber box built from 2″ thick extruded polystyrene (foam) insulating board. In the large chamber sits the fermenter, while the other two chambers house ice filled bottles. A small fan and return connect the ice chambers with the main chamber so cold air can be circulated past the ice bottles and around the fermenter. Instructions can be found here. The fan is tied to a thermostat so you can accurately set the desired fermentation temperature. As with the ice bath the bottles of ice need to be refreshed at least daily to keep the chamber cool. However unlike the ice bath, you can set and maintain a precise fermentation temperature. You can probably build one of these at home for $70-100 depending on your local material costs – the most expensive elements are the full sheet (4 foot x 8 foot) foam board and thermostat. I’ve also found a few links to even simpler designs that use just a big Styrofoam box (made from the same insulating board) but have no fan or thermostat. In this “box” design you add bottles of ice to the Styrofoam box directly and manage the temperature by varying the number of bottles used. This is the air equivalent of the ice bath above – it does not offer precise control, but may give you enough control to brew a decent lager. So those are some alternatives for brewing a lager if you don’t have a dedicated fermentation refrigerator and controller. Thanks for joining me on the BeerSmith Home Brewing Blog. You can grab a trial version of BeerSmith from BeerSmith.com. Be sure to sign up for my newsletter or my podcast (also on itunes…and youtube…and streaming radio station) for more great tips on homebrewing. Just another tipp that may apply only for a small minority of homebrewers: I have rented a place in an old cellar that was built in the 19th century a few miles away from my home in Germany. Originally it was used by a brewery for beer fermentation and lagering. The temperature is a constant 7-10 C throughout the year – perfect for Lagers. At the moment there are about 10 homebrewers in this place. It’s a very traditional solution and feel lucky to have found such a great place. Four Suggestions for Avoiding Off Flavors in Brewed Beer - Talking About Craft Beer And Traveling The World.